Little Shop of Horrors, a deviously delicious Broadway sci-fi smash musical, has devoured the hearts of theater goers everywhere. Seymour, a meek flower shop assistant stumbles across a strange plant he names “Audrey II”, after his co-worker crush. This foul-mouthed carnivore promises unending fame and fortune to the down and out Seymour as long as he keeps feeding it - blood. 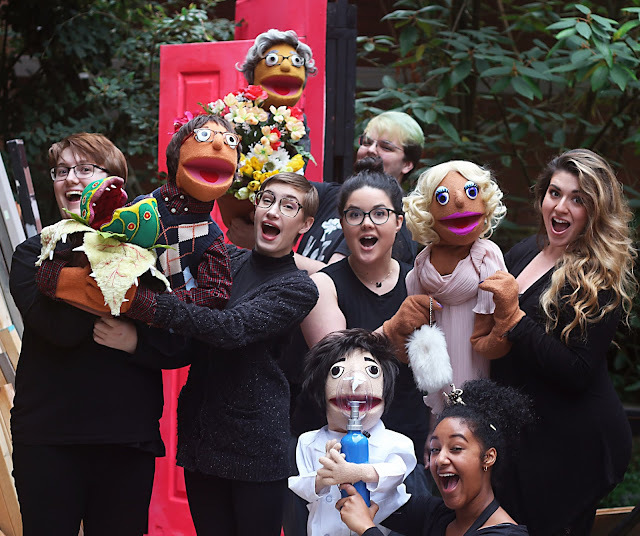 This production of Little Shop will feature custom-built puppets — (Avenue Q/Sesame Street style, in the leading roles of Audrey, Seymour, Mushnik and Orin, in addition to the usual puppet progression of Audrey II— to reflect our modern understanding that a voice and soul is not pre-determined by the skin it resides in. Both puppet and puppet-performers will perform in full view of the audience. Crystal, Ronnette, Chiffon, and the ensemble will be full-sized human beings. 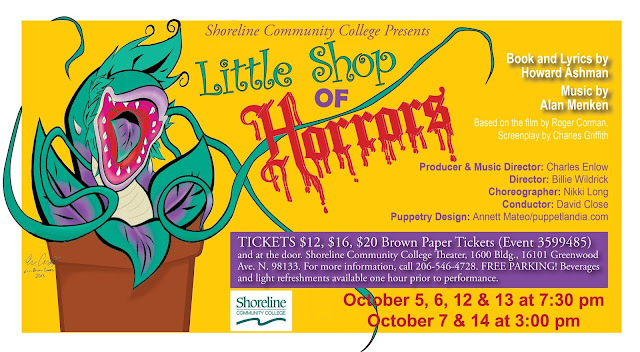 Eerily echoing a devastating lesson we’re learning hard here in 2018 America, “If you feed it, it will grow” – our production of Little Shop of Horrors has a message for all of us. I’m very excited to create a chance for actors to audition for the roles that speak to their soul and vocal range, regardless of gender, race, age or any other identity factor that might normally cause them to feel disqualified from consideration. 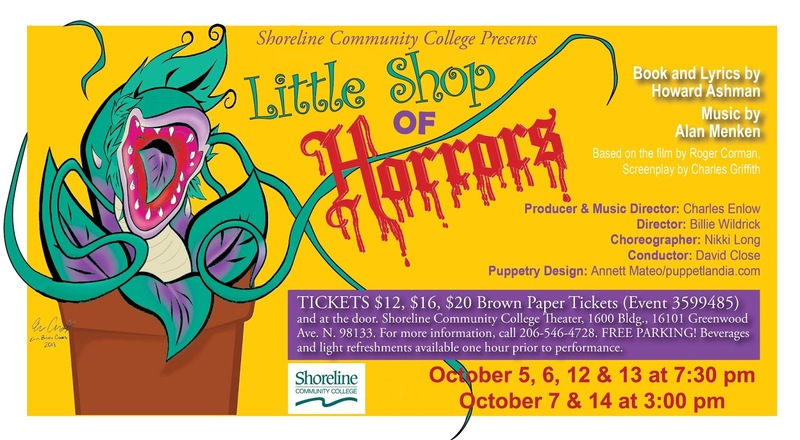 SCC Theatre, 1600 Bldg, 16101 Greenwood Ave N, Shoreline 98133. Tel. 206-546-4728. Shoreline Community College is committed to nondiscrimination. To request disability accommodation contact Services for Students with Disabilities, at least ten days in advance at: 206.546.4545/V; 206.546.4520/TTY; 206.533.5109/FAX; or e-mail at SSD@shoreline.edu.